This new home was built on the original site of the main homestead on a large dairy farm in Southland. The exterior has ply soffits, large beams and specially run cedar weatherboards. 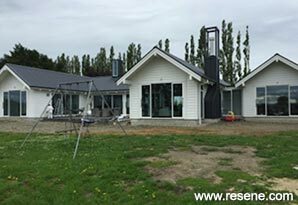 The sheer height of the project and painting the exterior in June in Eastern Southland proved to be the most major challenges, requiring careful planning to maximise the work rate. With two very similar colours to paint side by side, the painters had to pay careful attention to each colour was kept to its defined area. That attention to detail paid off when this home won the New Exterior over $25k Award at the New Zealand Master Painters Awards. Resene Wood Primer was applied to seal off the cedar to stop it bleeding, before topcoating in Resene Sonyx 101 semi-gloss waterborne enamel or Resene Lumbersider low sheen waterborne enamel. The colour scheme was designed by the owner and the architect with Resene Black White and Resene Alabaster running from the interior through to the exterior, with three feature walls, two in wallpaper and one in paint, to complete the look. Resene Room Velvet solventborne low sheen was used in wet areas, with trim and joinery in Resene Lusta-Glo solventborne semi-gloss, walls in Resene Zylone Sheen and ply timber ceilings in Resene Lumbersider low sheen waterborne paint.